New York (26 September 2018) – Prime Minister KP Sharma Oli has said Nepal has always avoided caveats as it has detrimental impact on mandate implementation and performance because it compromises much needed operational autonomy. In his address to a high-level event on Action for Peacekeeping held at the United Nations Headquarters in New York on September 25, the Prime Minister called on all the US member states to stand firmly together in the larger interest of international peace and security. As the nature and dynamics of conflicts around the world have become more complex and multi-dimensional, so have been the requirements and mandates of the peace operations. However, we are confronting with lack of resources and shortage of critical assets and equipment, according to Prime Minister Oli. “Every conflict situation is unique and requires different answer. Political solution to conflict has no substitute. As my own country Nepal has eloquently demonstrated; a home-grown, nationally owned and led political process can deliver sustainable peace,” the Prime Minister said, adding that full, equal, and meaningful participation of women was key to success of peace operations. Stating that Nepal had so far contributed over one hundred and thirty-six thousand blue helmets, without caveats, in total 45 UN peace operations, he informed the event that this year Nepal was celebrating the 60th year of its partnership for peace with the United Nations. As the prime minister apprised the high-level meeting, even at the height of national difficulty, Nepal continued to provide troops and police personnel, which demonstrates its strong commitment to the principles and purposes of the UN Charter. He took a moment to pay tribute to those brave soldiers, including 73 Nepali peacekeepers, who made ultimate sacrifice in the line of duty. He said he was humbled to address the event, representing a long-standing troop and police contributing country to the UN peacekeeping missions. “Action for Peace initiative by the Secretary General is a timely reminder for shared responsibility. Its success depends on all stakeholders playing their part with a renewed commitment for sustained partnership,” the Prime Minister said who has been in New York leading the Nepali delegation to the 73rd session of the UN General Assembly. Action for Peacekeeping initiative chaired by United Nations Secretary-General Antonio Guterres that began March 28 this year aims to focus its efforts on refocusing peacekeeping with realistic expectations, making peacekeeping missions stronger and safer, and mobilizing greater support for political solutions and for well-structured, well equipped and well-trained forces. Central to the initiative is the recently created Declaration of Shared Commitments on UN Peacekeeping Operations, which was developed over the summer by member states, the Secretariat and partner organisations. 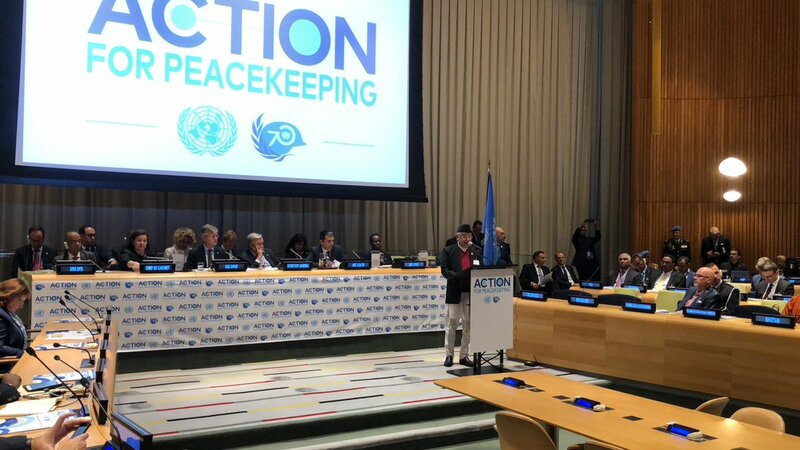 The Declaration sets a new agenda to renew political commitment to peacekeeping, and outlines commitments that all contributors to peacekeeping should fulfill in order to make UN peacekeeping more effective. It focuses on enhancing the political impact of peacekeeping, strengthening protection provided by peacekeeping, safety and security, performance and accountability, peacekeeping impact on sustaining peace, partnerships and the conduct of peacekeeping operations and of personnel. Present in the Summit were Minister for Foreign Affairs Pradeep Kumar Gyawali, Chief Advisor to Prime Minister Bishnu Rimal, Nepal’s Ambassador to the United States of America Arjun Kumar Karki, Charge d’ Affaires of the Permanent Mission of Nepal to the United Nations, Nirmal Raj Kafle, Secretary at the Ministry of Foreign Affairs, Shankar Das Bairagi, Spokesperson and Joint Secretary at the Ministry Bharat Raj Poudel and Chief of Protocol Dipak Adhikari.